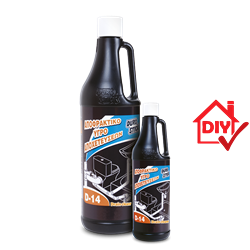 Effective cleaning liquid with instant action. It eliminates the need of using a plumbing snake and other unnecessary drain pipe unclogging related costs. It quickly unclogs pipes, bathroom sinks and bathtubs as well as toilet bowls and kitchen sinks. It dissolves accumulated fats, and scum, hair as well as paper, rags etc. Necessary for sewer piping of restaurants, hotels, hospitals, factories, public buildings, homes etc. The user must be very careful during application and wear gloves and goggles, following all the safety directions, as described on the container itself. 500-1.800gr, depending on the pipe diameter and the amount of accumulated waste.